In 2016, Clint Eastwood directed Sully, a movie that examined a real-life near-tragedy. 2018’s The 15:17 to Paris follows a similar path and takes on another historical event during which heroes emerged. On August 21, 2015, a train headed from Amsterdam to Paris. When a gunman attempted a terrorist attack during the trip, three Americans stopped him. In flashback, we get to know the men: Spencer Stone (himself), Alek Skarlatos (himself) and Anthony Sadler (himself). We trace their lives and what led them to their fateful actions in 2015. As noted in the last paragraph, the actual participants portray themselves in Paris, an unusual choice on Eastwood’s part. I suppose he hoped that this would lend a sense of verisimilitude to the project. Or maybe Eastwood just felt it would become a good promotional gimmick. Whatever the director’s rationale, this choice flops, as the three neophyte actors fail to provide compelling – or even competent - performances. 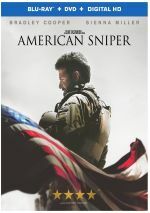 Though my synopsis involves all three of the Americans, don’t expect the film to tell their backstories in equal measure. Spencer heavily dominates, whereas we learn next to nothing about Anthony. While the film occasionally throws out nuggets about Alek, this remains Spencer’s show, and I can’t help but wonder if this discrepancy occurs because Stone offers the best work of the three. Though never genuinely convincing, Stone does come across as the most natural and charismatic of the men. That’s what we call “faint praise”, for Stone seems “good” simply because Skarlatos and Sadler are so terrible. They lack even the most basic ability to convey their characters’ personalities and journeys, whereas Stone occasionally almost sort of threatens to become competent. But in truth, Stone offers a largely amateurish performance, a factor that leaves a hole at the core of the film. Without solid acting, it becomes much more difficult to invest in the events. To compensate, Eastwood surrounds the neophytes with accomplished actors such as Jenna Fischer, Judy Greer, Thomas Lennon, Tony Hale and others. Heck, Jaleel White even proves there’s life after Urkel! This method worked for 1946’s Best Years of Our Lives, as it allowed amateur actor Harold Russell to keep his head above water. However, Russell’s character stood as only one relatively small aspect of the story, so his obvious restrictions as an actor didn’t become a prominent issue. Most of Best Years focused on roles played by professionals, a concept that reverses for Paris. Again, I suspect Eastwood hoped that the presence of reliable professionals would help hide the amateurs’ deficiencies, but given how heavily the film focuses on the three leads, this doesn’t work. In addition, it feels like the main actors’ flaws rub off on the rest, as they deliver fairly terrible performances in their own right. Seen elsewhere, I know the folks I mentioned boast good talent, but they offer weak work here and seem nearly as problematic as the amateurs. That said, I won’t pin the movie’s failure totally on the actors – professional or otherwise – as the script becomes the biggest problem with Paris. Adapted from a book written by the three leads, Dorothy Blyskal creates a screenplay that suffers from a surfeit of flaws. To start, the event that headlines Paris - the assault on the train – takes up a fairly narrow fraction of the film’s running time. The movie’s first half mainly concentrates on the three leads’ backstories – with the aforementioned emphasis on Spencer – and lands them in Europe almost precisely at its mid-point. As noted, the “action” portion of the train trek spans a brief portion of the movie. Eastwood throws out “foreshadowing” teases from time to time, but when all the backstory catches up and gets us on the 15:17, the dramatic events span less than 10 minutes, and much of that follows aftermath. This means we spend 71 of the film’s 94 minutes with exposition, and Paris doesn’t use those moments well. The roughly 45 minutes of pre-Europe material intends to set up the characters, but it fails to establish them in a compelling way. Again, Spencer receives the most prominent exploration, but even so, he feels ill-defined. The movie establishes a clunky “theme” of Spencer as someone who feels destined to make an impact and that’s as close as we get to any form of development. Instead, the movie simply follows the characters almost at random, and it can feel like whole scenes go missing. For instance, in one moment, a principal tells Alek’s mother that he’d be better off with the boy’s father, and she loudly protests. However, in the next shot, we see Alek head off to live with his dad. Huh? Shouldn’t there be some form of bridging sequence to develop that event? Many other scenes lack rhyme or reason. During his military training, Spencer sleeps on the floor, but I don’t know why. As young adolescents, the boys discuss how they want to attend prom, an event a good four years in their future – what 14-year-old boys fantasize about formal dances? None, and plenty of other clumsy scenes occur. Blyskal and Eastwood paint a black and white world and editorialize where they can, even when their viewpoints don’t make sense in the movie’s universe. If Paris managed to follow with a consistent theme about how religion helped elevate Spencer and the others, then I might not mind as much. However, the movie never goes down that path in a coherent way. Oh, Paris throws out occasional nods in that direction – mainly via Spencer’s belief in his own destiny – but these don’t develop in a manner that adds anything to the film. While we get the vaguest undercurrent of spiritual impact, those elements seem so random that they don't develop into anything meaningful. Instead, the occasional religious bit feels more like gratuitous propaganda to please the “Red State” crowd, and Eastwood’s occasional forays into gun-related areas feel the same. We get semi-editorializing about that domain on occasion but these bits don’t fit into the film, so they come across as Eastwood’s attempt to throw his POV at us. Or maybe Blyskal is responsible – I don’t know where the screenplay ends and the director’s perspective begins in this case. All I do realize is that these moments feel contrived and gratuitous. As does a bizarre sequence during the long, tedious “tourist” segment of the film in which Spencer and Anthony visit Berlin. A German tour guide tells them that they’re on the spot where Hitler died as the Russians closed in, but Spencer indicates that he thought the Führer expired elsewhere while the Americans threatened. The guide snaps back at Spencer in an angry, arrogant manner. Logically, we should learn that Spencer was correct and he got attacked solely for the sin of being an American. However, the tour guide had it right, so the scene serves no logical purpose. It shows a negative attitude toward Americans because… Make America Great Again? I can’t figure out why the scene exists other than to give the red meat crowd a reason to hate those stupid Europeans and their facts! Does Paris do anything right? Though I don’t like Eastwood’s choice to “tease” the climax throughout earlier moments, the action scene on the train manages pretty good drama. And now I’m out of “praise”, as Paris suffers from a myriad of flaws. Amateurish, clumsy, disjointed and downright dull, this becomes an embarrassment for all involved. 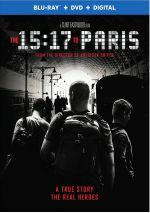 The 15:17 to Paris appears in an aspect ratio of approximately 2.40:1 on this Blu-ray Disc. Overall, I felt pleased with the image. In terms of colors, Paris went with a pretty standard mix of orange and teal that emphasized the latter. The film kept these fairly restrained, though, so they didn’t seem obnoxious, and the Blu-ray reproduced them with good fidelity. Downconverted to Dolby TrueHD 7.1, the movie’s Dolby Atmos soundtrack packed a pretty good sense of action, with active use of the various channels when necessary. Music filled the various channels in a satisfying manner, and effects fleshed out the spectrum in a logical way. Two featurettes appear here, and Making Every Second Count runs eight minutes, 11 seconds and includes comments from actors/real subjects Alek Skarlatos, Spencer Stone, Mark Moogalian, Isabelle Risacher Moogalian, and Anthony Sadler. They offer a recap of the dramatic events that formed the basis for the film. This becomes a brief but efficient overview. We get notes about the project’s path to the screen and the choice to cast the leads as themselves, performances, the story and adherence to facts, sets and locations. Though a bit superficial, “Portrait” delivers a reasonable take on some of the production topics. The disc opens with ads for 12 Strong and Tomb Raider. No trailer for Paris appears here. A second disc presents a DVD copy of Paris. It includes “Portrait” but lacks “Second”. While it may not be the literal worst film of Clint Eastwood’s career, The 15:17 to Paris must be close to the nadir. Clumsy, amateurish, and borderline incoherent, the movie fails in almost every possible way. The Blu-ray offers very good picture and audio along with two featurettes. Although it depicts a compelling event, the end result becomes a massive flop.